Although this website is the central hub of the studio's online presence, there are actually three different online accounts that my students and their families will need to access regularly. The following are guidelines for the use and differences of each. When students enroll in the Simply Music program, their student home materials, including their entire library of videos, audio tracks, and downloadable documents, are stored online. In order to access the curriculum, they will need to log in to a separate website. Please Note: Use of the Student/Parent Portal is only for students and families enrolling directly with the studio. If you are enrolling via a third-party (such as the City of La Mirada or another community organization), then your billing account and class schedule can only be accessed via that organization's own online portal or other support. After completing enrollment, new students are required to create a user profile on the Simply Music Student Store (https://students.simplymusic.com/store), which will allow them to purchase their curriculum. Simply Music curriculum is only accessible via the Simply Music Student Intranet, and is not available through my studio website. The same User ID and Password that you create for the store will also be used to access all future curriculum and materials on the SM Student Intranet Library (https://students.simplymusic.com). Please note that only one user profile is required per family. Practice is a very important part of learning music. A common reason for students discontinuing lessons is because practice at home is not working well. I want you to be successful, so at Piano Belloso Music Studio we use a modern practice tool called Better Practice that makes practice easier, smarter and more fun. It puts everything you need to practice at your fingertips, including the teacher! Send questions during practice. No more waiting for the next lesson and losing a week of progress. Track your practice, what and how long, as well as your progress. The teacher can see this too. See other students who are learning just like you. Add videos and backing tracks. Have fun playing along as if you are in a band. 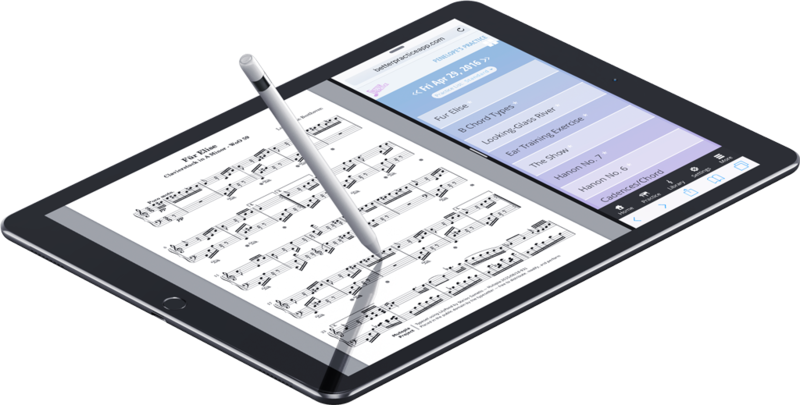 Better Practice is a music app that works on any device with a modern browser including iOS and Android smartphones and tablets, Macs and PCs. Just open up a browser. Nothing to download!